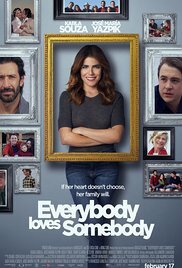 Everybody Loves Somebody is a bilingual flick starring Karla Souza (Clara) and Jose Maria Yazpik (Daniel) as former lovers who are reunited when Clara's parents decide to have a formal wedding after 40 years. Daniel abandoned Clara many years ago, but her family stayed in contact with him and invited him to the wedding. Clara doesn't know he will be there and brings her co-worker to the wedding as a last-minute date. When she sees Daniel, old feelings come rushing back. Clara is conflicted: Should she risk getting hurt again and go with the more mature Daniel whom her family likes? Or should she go with her Australian co-worker who is younger and safer but who is not really her type? Everybody Loves Somebody film touches upon some complex issues including the difficulties of dating outside one's race and how love evolves over time. It also highlights how every relationship is unique for each specific couple. Although Everybody Loves Somebody has its moments, overall I found it to be rushed, predictable, and derivative. The most redeemable qualities were the acting and the dialogue, which saved a weak story. This is a fine family comedy, but it is not a must-see by any means. The film includes subtitles, so if you are not fluent in Spanish you will still be able to follow the plot.